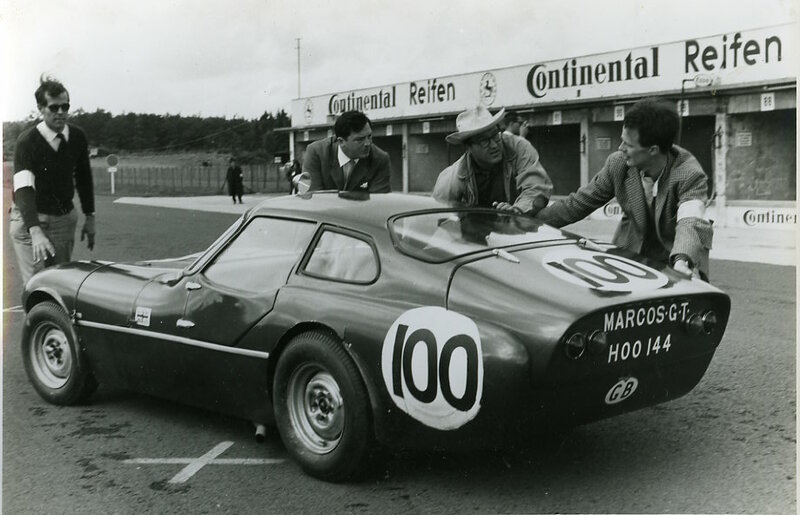 The second works fastback was driven in the 1963 500km at the Nurburgring by Tim Lalonde and well known Sebring Sprite racer Peter Jackson, who came 3rd in the German 500km race in a Sebring Sprite in 1961. 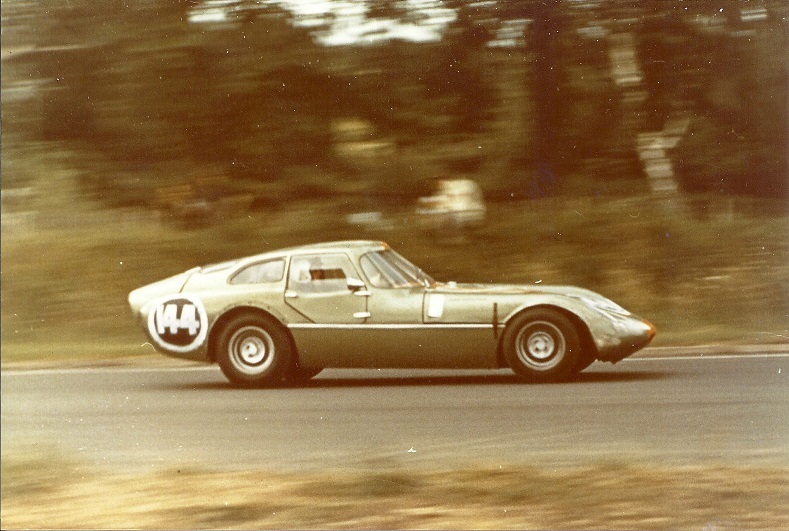 Tim Lalonde was a Marcos regular, combining driving his own Gullwing HOO 144 (ex Stephen Minoprio) with the works cars. 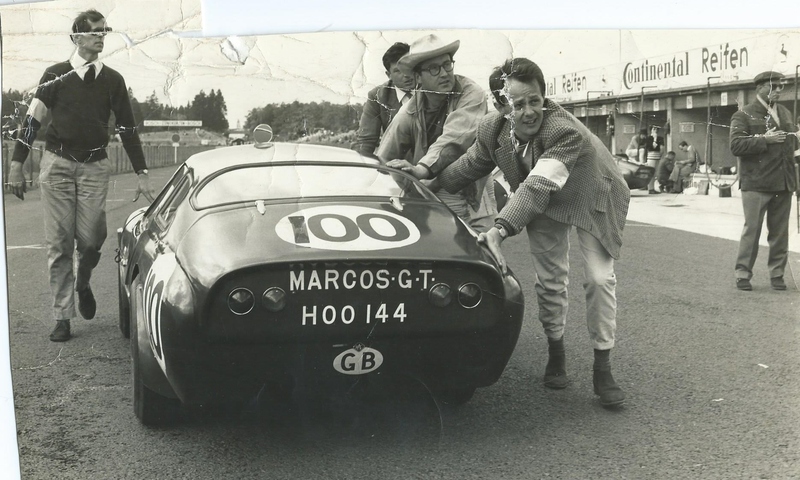 He would later also race a Mini Marcos for the works. As the car had to be road registered, the works fastback ‘loaned’ the registration from Tim’s Gullwing. And as it was racing on a shoestring, both cars shared one racing engine too. Peter Jackson (with white hat) was kind enough to send me some wonderful pictures taken during the 500km race weekend. The guy in the tweed jacket is his co-driver Tim Lalonde. Although he was racing the other works car, Jem is still looking smart with his tie. Does anybody recognise the other people on the pictures? 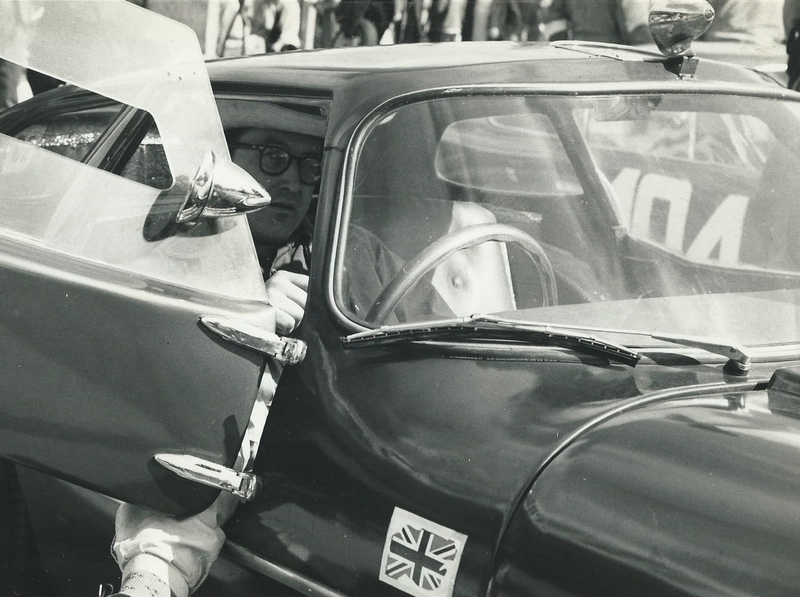 After the 1963 season the car was sold to the Cook brothers who used it in hillclimbs and club events. They swapped the bonnet for a ‘low nose’ example and painted the car Aston Martin green. The car was sold to Brian Henton, who later was to drive in F1, who crashed it.’The fastback was the first race car I owned and at the time I hadn’t got a clue about racing at all. At the second or third meeting, at Silverstone, I asked a befriended Aston Martin driver what tyre pressure he was using on his car, and I simply pumped my tyres to the same pressure. No wonder the car handled like a pig. Trying to make the best out of it, I arrived at Copse but lost control. The car went backwards over the grass and hit the sleepers. These crashed the chassis and the top flew off making way for myself. Amazingly I was unhurt after landing in the crowd. The car definately was a mess, I can tell you’. The bonnet, engine and odd mechanical bits were sold off. Henton reckons he got back all the money he invested in the car by selling bits of the woodwork with his autograph! So this car sadly does not survive! Brian Henton at full speed!